The Strip Tube Ruler™, and its little brother the Strip Tube Junior™, have become our favorite rulers for creating complex looking quilts that are simple to piece! 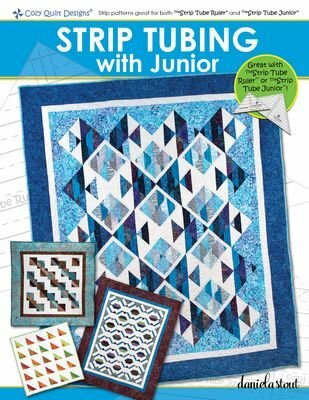 To celebrate the Strip Tube Junior™, a book was created with SIX different quilt patterns with stunning variety. Each pattern offers between five and six different sizes, making this a go-to book for any project. This class covers the Kissy Fishy pattern and is taught by Sally Ellis! Bring the following items with you to class: - Sewing machine and the power cord for the machine - General sewing supplies (e.g. pins, scissors, thread) - Rotary cutter and a good (e.g. new) blade - Rotary cutter ruler for cutting strips WOF (width of fabric) The following are required for the class: - Strip Tubing with Junior book (available at shop) - Strip Tubing Ruler Junior (available at shop) - Fabric based on pattern requirements Pattern offers the following sizes: Wall Hanging (40 x 40); Lap (48 x 62); Throw (76.5 x 76.5); Twin (76.5 x 90.5) and King (105 x 105) Fabric requirements: - 2 1/2 strips (12 for Wall Hanging; 14 for Lap; 36 for Throw; 48 for Twin and 88 for King) - Background fabric (3/8 yard for Wall Hanging; 5/8 yard for Lap; 1 1/3 yard for Throw; 1 2/3 yard for Twin; 3 1/4 yard for King) - Setting triangles (1/2 yard for WH; 3/4 yard for Lap; 1 yard for Throw; 1 1/4 yard for Twin; 1 1/2 for King) - Border 1 (1 yard for WH; 3/8 yard for Lap; 5/8 yard for Throw/Twin; 3/4 yard for King) - Border 2 (n/a for WH; 3/8 yard for Lap; 2/3 yard for Throw/Twin; 3/4 yard for King) - Border 3 (n/a for WH; 1 1/2 yard for Lap; 1 3/4 yard for Throw/Twin; 2 1/3 yard for King) ** please verify yardage indicated the book based on the size that you want. If you want the fish to pop more, try to divide your strips into dark for the Fishy blocks and light for the Water blocks. For the wall hanging size you would need 8 (10,20,28,48) dark strips and 4 light strips (4,16,20,40). Note: It is a good idea for any class or place you go with your sewing machine to bring a surge protector power strip. You will never know when you might need it.